An overflow crowd of dog lovers unleashed their opposition to reducing the size of the Starr Farm Dog Park and its hours during a Burlington Parks Commission meeting Tuesday night. 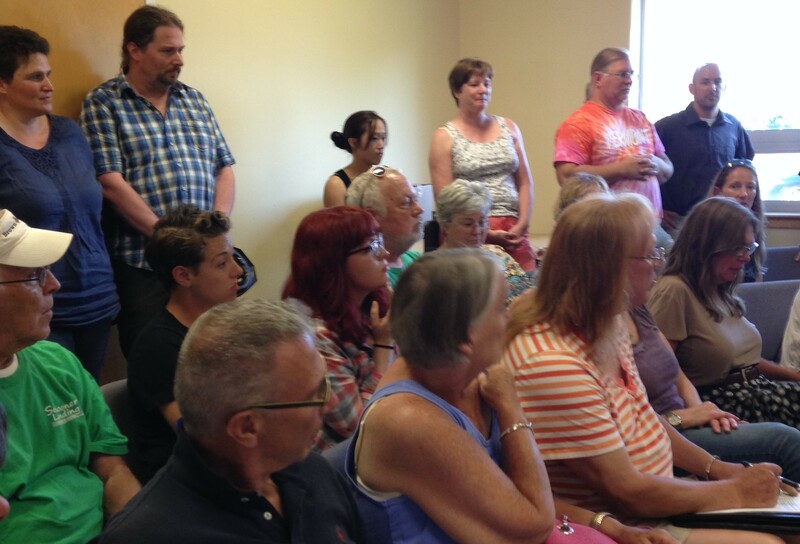 More than 50 people crammed into a room at the Burlington Department of Public Works to oppose possible changes at the popular New North End dog park. Some park neighbors have complained it is too noisy and busy, straining the facility and a small parking lot. Speakers disagreed, and most also opposed the idea of charging fees to use the park — especially for Burlington residents. "I think it would ruin the park and it would really piss people off," Maureen Schakey of Burlington said just after the meeting, reiterating comments she made during the session. She added: "If you have a kid you don't have to pay to go to the playground. What's the difference?" Catherine Foley said that she hears children at C.P.Smith School saying the Pledge of Allegiance and shouting on the playground from inside her house. "I don't call the city to complain, because our kids need education," she said. Dog park neighbors shouldn't complain either, Foley said. And dogs need exercise, she said, adding, "The Starr Farm Dog Park is a jewel in the Burlington Park system." More than a dozen people, all fans of the park, spoke during the public comments period. No park critics spoke out. City Councilor Dave Hartnett (I-North District), who has called for changes on behalf of neighbors concerned about the park, was not at the meeting. The ideas are preliminary, and no action was taken Tuesday. Nancy Kaplan, chair of the commission, thanked the crowd for coming and speaking their minds. "No one's closing Starr Farm," she said. "What our intention has been all along is to figure out the balance." Parks and rec director Jesse Bridges also thanked the group for coming. Last month, he told Seven Days that reducing the park's size was an option. But he seemed to back away from that Tuesday, emphasizing other possible measures. Those include user fees and the creation of off-leash times at other city parks to take the pressure off Starr Farm, which is one of two dog parks in the city. Commission member Carolyn Hanson expressed concern about making the park smaller. "That wouldn't be the first thing I would do," she said. Bridges emphasized the preliminary nature of the ideas. "We're not recommending any action," he said. "We're putting these ideas out on the table, formally."